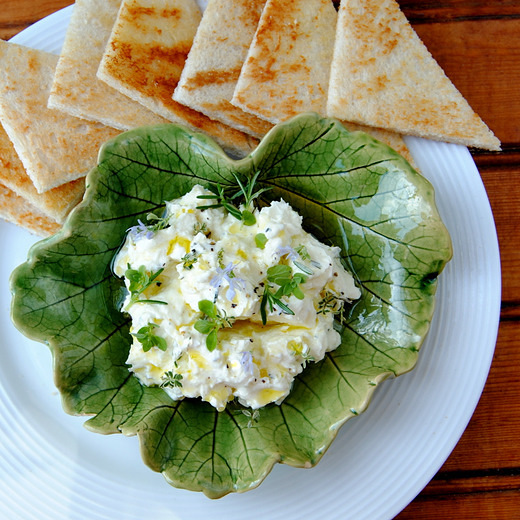 Strained yoghurt cheeses (such as labneh) are usually flavoured after the yoghurt's been thoroughly drained in cheesecloth hung over a bowl, but I thought I'd try adding garlic, lemon zest and fresh herbs right at the beginning. I find that fresh garlic tends to trample all over the delicate, milky flavour of soft white cheeses, so I figured that by adding it - and the woodier herbs and lemon - to the yoghurt before I drained it, the tastes would mingle and mellow over a few days. They did. This is a beautifully silky cheese that's good topped with a generous slosh of grassy olive oil and some fresh thyme and marjoram leaves (I also added a few fresh rosemary flowers). Serve it with hot toast, melba toast, bruschetta or salty crackers, or add large dollops to the top of a quiche or vegetable tart. Alternatively, you can roll it into little balls and coat these with cracked black pepper, herbs, toasted sesame seeds, spices or spice blends (such as za'atar), or whatever takes your fancy. I added some fresh cream (hence the 'double-creamy' in the title) but this isn't essential. 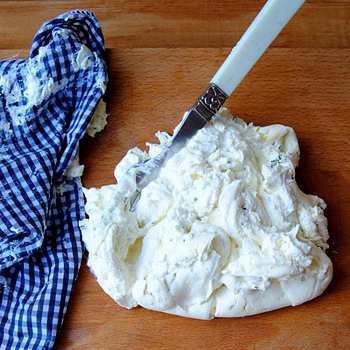 Do use a full-fat, thick, natural Greek yoghurt. I thought this cheese would be ready in two days, but it was three days before it was firm enough for my liking. If you're going to hang it for longer than two days, or the weather is very hot, put it in the fridge. If your fridge has wire racks, clip the knot of the cloth to the rack with a few clothes pegs and place a bowl underneath. If your fridge has glass shelves, put the cloth in a sieve set over a bowl. In a large bowl, lightly whisk together the yoghurt, cream, lemon zest, lemon juice, garlic, fresh herbs and salt. Place a piece of cheesecloth or muslin (or a fine clean tea towel or napkin) in a sieve and place it over a bowl. Tip the yoghurt into the cloth, gather up the corners and tie them into a knot, or secure them tightly with an elastic band. Hang the cloth over a bowl or a sink (see my notes above) for two to three days, or longer, if you'd like a very firm cheese. The longer you leave it, the stiffer it will be. Gently squeeze and massage the cloth every now and then to encourage the liquid from the inside of the 'ball' to run out. Tip the cheese onto a board and, using a large spoon or palette knife, mix it well. Season to taste with salt and pepper and tip into a serving bowl. Pour some olive oil over the cheese and scatter with fresh herbs. It looks lovely and fresh and I love the idea of adding different herby flavours. How long does it last once it's ready? And how much garlic did you use in this one? I'd like to try it for the school lunch box, just to add variety, as I'm running out of ideas for my youngest, who isn't into sandwiches. BTW I love the vine leaf bowl in the picture - so gorgeous! Oh my goodness, Kit. To my burning shame, I left out the garlic. (Only the second-most important ingredIient in the dish.) Thanks for noticing that. Three small cloves of garlic, peeled and finely grated or chopped. Have amended recipe. My kids are also very rude about the sandwiches I make them. Wow,it looks and sounds lovely!! Thanks, Jane-Anne, I'll be trying this very soon... they'll have the fanciest lunch-boxes in school! Busy getting my shopping list done when I saw the lemon juice ingredient. I think it is the juice of one or is it more ? TLC Bear. I am so sorry. Once again I made a mistake in the recipe. It should be the juice and finely grated zest of one lemon. Yeaa made mine on Friday evening like that. One day still to go. Resisting the temptation so far of having it before it is completely done. TLC: So exciting! Let me know how it turns out. Finished the first batch going to start the second. We have a sarmie club at work and the cheese where one of the spreads in the fridge. The men here really enjoyed it. Hi TLC! Thank you for letting me know. I'm delighted it worked for you.